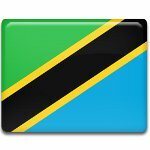 January 12 is Zanzibar Revolution Day, a very important holiday in Tanzania. This holiday commemorates the day the Zanzibar Revolution in 1964. Modern Tanzania merged from Zanzibar and Tanganyika in 1964. Tanganyika was granted independence in 1961 by Britain while Zanzibar remained its administrative unit until 1963. Zanzibar was granted independence only in 1963 and the power came to the Sultan of Zanzibar. After a series of parliamentary elections the Arab minority succeeded in retaining the hold of power it had inherited from former existence of the country and overseas territory of Oman. But African Afro-Shirazy Party allied itself with the left-win Umma Party and on January 12, 1964, mobilized revolutionaries under the leadership of John Okello on the main island Unguja. They succeeded to overrun country's police force and seized their weapons. The revolutionaries proceeded to Zanzibar Town and overthrew the Sultan and his government. African minority came to power that followed reprisals against Arab and South Asian civilians. This resulted in death toll with estimates ranging up to 20,000. In April 1964 the independent republic merged with Tanganyika and Zanzibar got status of a semi-autonomous region.